The Green New Deal Resolution has been alternately vilified, glorified, and dismissed since freshman Congresswoman Alexandria Ocasio-Cortez and veteran Senator Ed Markey unveiled it last month. We spoke to policy adviser Rhiana Gunn-Wright about the resolution and the role of markets and natural climate solutions. 18 March 1019 | Its foes claim the Green New Deal will take away your hamburgers, ground your flights, and remove environmental markets from the palate of options available for meeting the climate challenge. While reality says we must reduce methane from ruminants and a slew of other greenhouse-gas emissions from airplanes, the Green New Deal makes no direct mention of either. It instead focuses on targets and investment in new technologies, including those that help land systems absorb greenhouse gasses. As for market mechanisms, Green New Deal policy adviser Rhiana Gunn-Wright says they’re key to meeting the climate challenge. 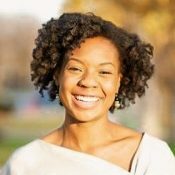 Gunn-Wright is the policy director for New Consensus, which is a non-governmental policy shop that helped draft the Green New Deal resolution and is now working with the offices of Congresswoman Alexandria Ocasio-Cortez and Senator Ed Markey to create legislation around it. New Consensus emerged as a reaction against market-led reforms that many believe have exacerbated inequality, but Gunn-Wright says the organization is not opposed to the use of market mechanisms within a regulatory apparatus.